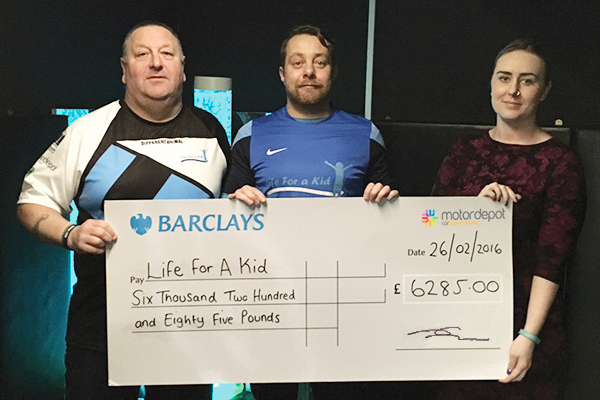 Motordepot is pleased to present a cheque for £6,285 to Life For a Kid, one of our nominated charities, following a joint-initiative with Barclays Partner Finance in November 2015. Life For a Kid, was set up in March 2009 with the aim of helping children under the age of sixteen by offering funds and equipment to help them lead a better life and to also help children who require life saving or life changing operations. Their objective is to promote physical and mental health and relieve sickness amongst children, young people, their families and carers in particular but not exclusively through the provision of financial assistance, support, education and practical advice. Life For a Kid Founder and Head of Operations Dean Hoggard said the donation had been a "massive boost" and would enable the Beverley Road-based charity to invest in improving its interactive sensory rooms which are enjoyed by disabled children and their families throughout Hull and the East Riding. Dean added: "Life For a Kid cannot thank Motordepot enough for its support throughout 2015. The money they have raised on our behalf has delivered a massive boost and will be invested in improving our new sensory rooms facility for the benefit of disabled children in the region." Motordepot were treated to a tour of the sensory rooms facility and privileged to see the fantastic work that goes on at the Life For a Kid centre in Leonard Street, Hull.